A pastor for the Church of the Brethren in the Dominican Republic has witnessed the confusion and devastation spurred by the statelessness crisis that the Office of Public Witness wrote about in the previous blog. Battling a high court ruling can seem nearly impossible, but mitigating its impact by helping those affected is how he has been approaching the situation. Brothers and sisters in this denomination, especially members living in bateyes and including young people and children, have been deprived of state documents, leading to an uncertain future. Brethren have helped one another travel to obtain, fill out, and return paperwork to regain citizenship, a process that many do not have the finances, orientation, or even motivation to complete. The pastor says that speaking out against this situation is risky, not only for the stateless individuals, but even for himself as a pastor. Some government officials, judges and nationalists are suspicious and sometimes spiteful toward those who oppose the court ruling due to their bias against those born of Haitian decent. For the coming year, research will be carried out to determine how many church members in the affected groups got their legal documents through the regularization plan and how to help the children of those who refused or somehow did not get them documents. Another project will also be under way to visit each church and determine the exact number of cases of statelessness and document the details of each. At the Greensboro Annual Conference 2016, an insight session will be led by Dominican Brethren and is called “Iglesia de los Hermanos—Looking Forward and Looking Onward”. These leaders will share updates and discuss the vision of the church in the Dominican Republic, in light of this issue and others. Read the stories of this population at http://stories.minorityrights.org/dominican-republic/. Watch the trailer for the upcoming documentary “Our lives in transit” / “Vidas en tránsito” here! “With the stroke of a pen, authorities in the Dominican Republic have effectively wiped four generations of Dominicans off the map. Without nationality, tens of thousands of people have become virtual ghosts, who face serious obstacles in accessing basic services in the country,” said Erika Guevara-Rosas, Americas Director at Amnesty International. Here at the Office of Public Witness, these words propel us to act, raising awareness and engaging in efforts to help alleviate a dire situation. This reality faces a large population in the Dominican Republic (DR), where the Church of the Brethren has a significant presence. Deprived of the basic right of legal nationality, the DR’s stateless community lacks the paperwork to attend schools, work at a formal jobs, get married, and have opportunities that many people would see as inherent to a normal life. Since Nathan Hosler’s trip to the DR in 2014 and to the Haitian side of the border in 2015, the situation surrounding statelessness in the region merits a current report. President of the DR since 2012, Danilo Medina, just won reelection in the 2016 presidential race. Although Medina’s administration has made some sweeping developments, such as creating 2,500 new schools and maintaining one of Latin America’s fastest growing economies, the painful situation for thousands of Dominicans of Haitian decent who were “repatriated” to Haiti has not improved under his administration. Following the 2010 constitutional change that eliminated citizenship to those born to migrants in the DR, the DR’s highest constitutional court passed decision 168-13 in September of 2013 that retroactively stripped the citizenship from all of those born to undocumented immigrants since 1929, mostly of Haitian decent. This action left a population of approximately 200,000 people stateless. Following this, international alarms sounded. 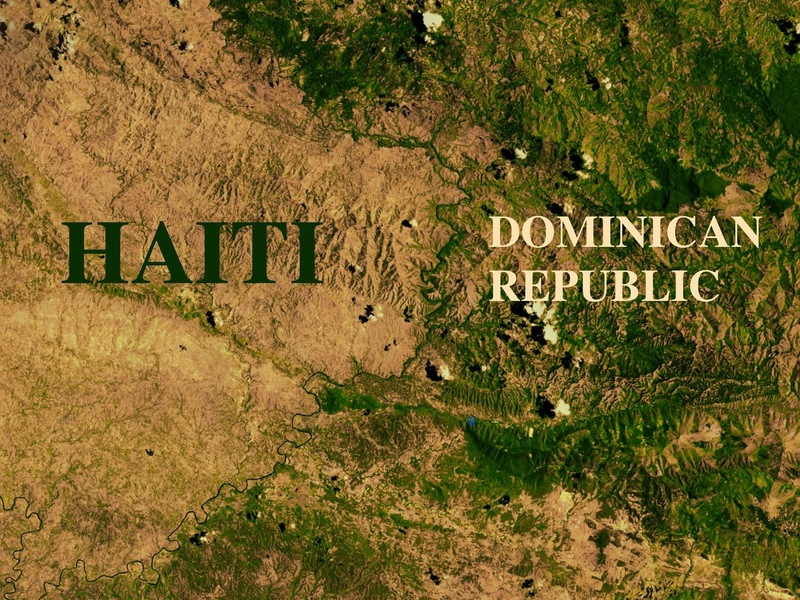 The United Nations, human rights organizations, and others cried out against the unjust racial bias inflicted upon those of Haitian decent born in the DR, rendering them with neither Dominican nor Haitian citizenship. The United Nations High Commissioner for Refugees (UNHCR) published a press release urging the Dominican Republic not to deport thousands of stateless people “whose citizenship was thrown into question by a 2013 ruling.” The Church of the Brethren also joined the voices in objection to this decision that affected our church community as well. Succumbing to international pressure, the Medina administration created a naturalization program that expired in February of 2015. Many affected individuals did not learn about the program in time to apply until after it had already expired. Following this, a regularization plan that expired in June 2015 allowed individuals to register with the government. Since then, the Dominican government claims it has granted more than 250,000 previously undocumented migrants temporary visas and reinstated citizenship to 55,000 of the Dominicans born to migrants. However, this leaves a multitude of individuals who did not register. “Most people here were afraid to register,” Pérez said. “They didn’t understand the process or thought they would be deported.” Medina and his government consider the plan a success, not recognizing that many were unable to register. The Church of the Brethren donated $16,000 and worked with the church in the DR to assist affected individuals through this regularization process. The documentation and trips to the government offices proved a significant financial burden to those trying to attain citizenship. Without family or social networks in Haiti, many stateless individuals are in makeshift camps along the DR-Haiti border. The International Organization for migration estimates about 20,000 official deportations have been carried out, while approximately 60,000 individuals have fled to Haiti on their own in fear of persecution, violence, or deportation. By the end of 2016, an estimated 120,000 individuals will cross over to Haiti. Camps are still swelling near the border, and tensions are rising. “Everyone here is more afraid of aggression from Dominican citizens than aggression from the government,” said one migrant. The Church of the Brethren has visited the border area, offering prayer and medical assistance. About 25 other organizations are working in the camps to provide various forms of assistance. On behalf of the Church of the Brethren, the Office of Public Witness sent a letter signed by other faith-based organizations to Ambassador Brewster in Santo Domingo, DR, urging him to push for the creation of protocols for deportation that respect human rights, support those affected through documentation guidance and appeals processes, and the restoration of nationality to those affected. The Office of Public Witness continues to work with other organizations such as Church World Service to monitor and respond to this situation. How we spend our money shows what we think is important. In the past few years, the U.S. government has struggled to pass a budget, but some fiscal decisions are easier to make than others. With the support of Congress, the Administration has discussed expanding U.S. funds to Israel to further expand Israel’s already excessive military edge. While Israel is a major U.S. ally in the Middle East, policymakers have failed to make progress on a more pressing fiscal issue that directly affects U.S. citizens: the debt crisis in Puerto Rico. Puerto Rico’s expansive debt has crippled its economy and forced many citizens to leave the island territory. What does it say about our country that efforts to bolster Israel’s military receive high praise, while Congressional efforts to offer financial support for Puerto Rico continue to stall? While these two issues are wholly separate in both their justifications and mechanisms for receiving U.S. support, juxtaposing these two cases reveals misplaced priorities in the American agenda relevant to people of faith. After receiving a widely-supported letter from the U.S. Senate, the Administration has stated that it aims to enhance Israel’s annual $3 billion military aid package to nearly $4 billion. Since Israel became a nation in 1946, U.S. military aid to Israel has exceeded $130 billion, which is nearly half of all military aid sent to the Middle East in that same time period. With such sustained support, Israel clearly meets any arbitrary threshold for defense, making an increase in Israel’s superlative aid excessive and irresponsible. Israel has proved its military independence in defense expenditures and by its arms manufacturing industry that exports to 130 countries, including the U.S. and U.K. Israel’s arms trade is problematic in itself since many of Israel’s arms exports contribute to conflicts in places such as the Ivory Coast and South Sudan. The question of military support for Israel consequently goes beyond a matter of fiscal responsibility to one of moral responsibility. Does Israel need our support? Does it even deserve it? The Puerto Rico’s debt crisis poses another moral problem, though one exacerbated by U.S. inaction rather than direct financial endorsement. The Puerto Rican government is currently $72 billion in debt and has a $2 billion debt payment to make by June 1. In addition to irresponsible governing, Puerto Rico’s special designation as a U.S. territory helped create the current crisis. Puerto Rican statehood is debated even among its citizens, but without many state protections, financial loopholes enabled large corporations and hedge funds to lend money to the Puerto Rican government at irresistible rates. In the wake of aggressive lending and borrowing, Puerto Rico’s debt ballooned out of control. The Puerto Rican government and several members of Congress have pushed legislation to help lessen the impact of Puerto Rico’s debt on its struggling population. The proposed aid to Puerto Rico is frequently couched as a bailout, but unlike financial assistance to Israel, the current debate is not about distributing U.S. taxpayer money. Rather, the current legislation has the modest goal of providing debt relief to Puerto Rico by granting it municipal bankruptcy protection, a privilege held by all U.S. states but not the Puerto Rican territory. Bankruptcy protection would restructure debt payments to ensure the well-being of the 3.5 million Puerto Rican people, about 45% of whom live in poverty because of this financial crisis. Without this protection, Puerto Rico could be required to further defund essential emergency services and continue to raise taxes in order to meet payment deadlines. Sales taxes in Puerto Rico already sit at a soaring 11.5% and thousands have left the island to escape an economy that leaves many overqualified and unsupported. Efforts to pass helpful legislation to aid Puerto Rico continue to falter, begging the question: Do we have our priorities right? While military aid to Israel uses taxpayer money to further equip the most militarized nation in the Middle East, debt relief to Puerto Rico addresses the immediate need of struggling U.S. taxpayers. Too frequently it seems our fiscal sense is disconnected from common sense. Our country was founded on the self-evident truths that everyone is created equal and endowed with certain unalienable rights. In a world filled with money and potential profit, however, these rights often become mere footnotes in discussions about dividends and economic growth. U.S. arms manufacturers receive good business from Israel because of military aid, while Puerto Rico doesn’t seem to have much to offer. As Brethren, we tout our tagline “Peacefully, Simply, Together” but often forget its implications. We are called to be peaceful, acting from a place of love and support. We are called to live simply, to walk with God rather than join the rat race. Finally, we are called together to be strengthened as a community of faith. These three pillars rest on the recognition that every person is a precious creation made in the image of God. This belief undergirds our work through Global Mission and Service and within our own communities. It is a foundation for witness that gives us a prophetic voice. Recalling that our political system is founded on the equal rights of everyone to pursue life, liberty, and the pursuit of happiness, we must use our prophetic voice to remind those with power that such rights cannot be ignored, that each person has inherent value deeper and more beautiful than market value, that military excess works against the pursuit of peace and simplicity. Our elected officials must be reminded that they serve the People, especially the citizens of Puerto Rico. Today, the Office of Public Witness joined several other faith-based organizations in denouncing U.S. military aid and arms trade in the Middle East, including Israel. The Office also works with Jubilee USA, an organization focused on providing debt relief. Check out their website for more information about Puerto Rico and how you can get involved. This past weekend the Office of Public Witness participated in Ecumenical Advocacy Days, a conference of people of faith from around the country. We worshiped and attended workshops together on the theme of “Lift Every Voice! – Racism, Class & Power.” The weekend began powerfully as Rev. Dr. William Barber implored us to prophesy, to call out injustice in the world, and to demand policies that recognize that God’s image in everyone. That call to unite as a moral voice for justice continued to frame the weekend as we delved more deeply into the issues of voting rights and the Trans-Pacific Partnership trade deal. The event concluded on Monday as together we met with our congressional representatives. OPW’s work sometimes feels isolated, but the expressions of solidarity and love in word, song, and action expressed this weekend left us all feeling revitalized and empowered. As we stood and sang “Lift Every Voice and Sing,” we knew that we were surrounded by a powerful and determined community. Though we returned to our daily work this week, we have EAD powerfully reminds us that our work represents deep sentiments shared by many throughout the country. Yet this empowerment brings many challenges. As all of the speakers reminded us, we are called continually to be perturbed by injustice, to wrestle with our faith, and to not stay silent. On Saturday night we had the privilege of meeting with the other Brethren, Mennonite, and Friends in attendance. Members of a Mennonite church in Cleveland, Ohio had many members graciously shared their experiences as a predominately African-American congregation. As we think about how every voice can be lifted on the national level, they called us to begin by considering whose voices are not being heard in our own congregations. As we consider the importance of lifting every voice, the personal stories such as the one’s shared by our sisters from Cleveland are essential. Everyone is created in the image of God and thus any work for justice must necessarily be personal, connected to the realities of all people’s lives. Perhaps that is the greatest message that we had to bring to our legislators this Monday. Justice is personal; when not all voices can be heard singing its refrains, we are silencing God’s beloved. May you too be energized and uplifted for your work and your journey with God. If you are interested in learning more about the Voting Rights Advancement Act of 2015, defeating the Trans-Pacific Partnership trade agreement, or view additional material from the conference, visit advocacydays.org. 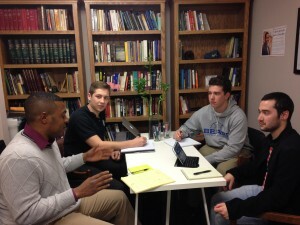 As part of the Church of the Brethren’s work on Nigeria through Global Mission and Service, Brethren Volunteer Service (BVS), the Office of Public Witness, and students at Elizabethtown College have partnered to begin data collection and analysis of Boko Haram violence in northeastern Nigeria. The Church of the Brethren in Nigeria (EYN) has a strong presence in the northeast, an area terrorized by Boko Haram. Because of the Brethren presence in northeast Nigeria, the Church is in a unique position to shed light on the impact of Boko Haram’s violence, especially as it targets Christian communities in the northeast. Using data gathered by Dr. Rebecca Dali, Center for Caring, Empowerment, and Peace Initiative (CCEPI), BVSers John and Pat Krabacher initiated organizing Dr. Rebecca’s raw data last year to display the 9745 killed by Boko Haram in the northeast in a “Wall of Healing” seen at Annual Conference 2015. Pat Krabacher is updating the “Wall” data with the latest data from CCEPI and integrating short stories of victims into new visual data displays with assistance from Justin North (CoB Columbus, OH). 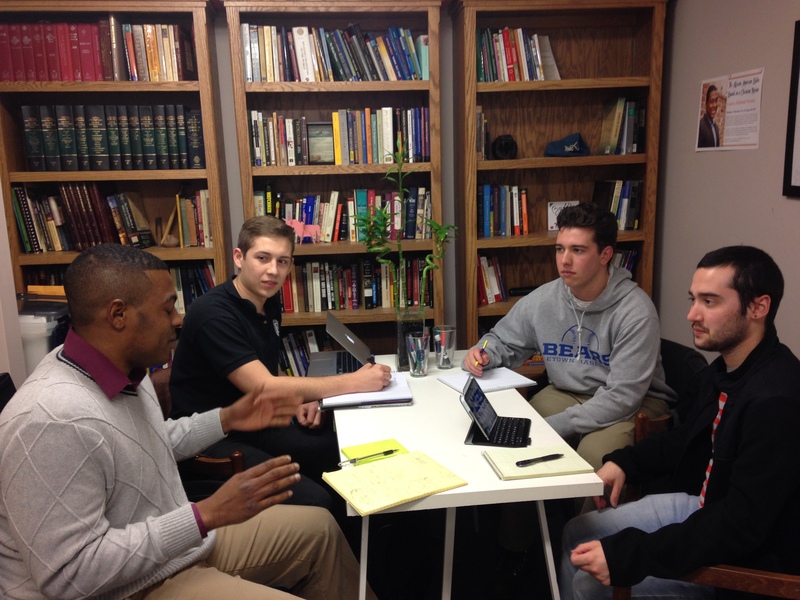 At Elizabethtown College, a Church of the Brethren institution, Religious Studies and Interfaith Leadership Studies majors will supplement Dr. Dali’s data by gathering a comprehensive collection of existing news reports about Boko Haram. Advised by Assistant Professor Dr. Richard Newton, they are charting the role of geography, demography, and religion in the conflict. By capturing these two data sets, we hope this research can better represent the impact of Boko Haram violence which can be communicated to U.S. and international humanitarian aid organizations . Nathan Hosler, Director of the Office of Public Witness, and BVS worker Jesse Winter will work to create a report of this data to be shared with church members and potential advocacy partners. Visual representations of preliminary data should be available through Global Mission and Service at Annual Conference in Greensboro, NC. As we look at the persisting crisis in Nigeria, now two years after Chibok and nearly seven years after the beginning of Boko Haram’s insurgency in 2009, we hope this partnership and analysis can help communicate the pain and suffering of our EYN and Muslim neighbors and bring about meaningful peacemaking initiatives. 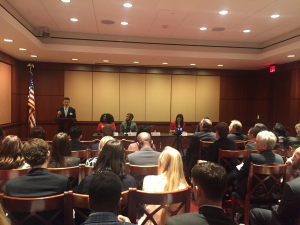 The following is a statement from Nathan Hosler, Director of the Office of Public Witness, given at a Congressional briefing entitled, “Nigeria after the Chibok Abductions: An Update on Human Rights and Governance.” The briefing took place on April 13, 2016, the day before the two year anniversary of the Chibok abductions. Other speakers at the briefing included Omolola Adele-Oso (Co-founder and Executive Director, Act4Accountability), Madeline Rose (Policy and Advocacy Advisor, Mercy Corps), and Lauren Ploch Blanchard (Specialist in African Affairs, Congressional Research Service), with Dr. Carl Levan (Assistant Professor, School of International Service, American University) moderating. Opening Remarks were given by Congresswoman Frederica S. Wilson and Congresswoman Sheila Jackson Lee. The Church of the Brethren is a Protestant denomination and is, along with the Mennonites and Quakers, a Historic Peace Church. In 1922 the first workers from the Church of the Brethren in the United States arrived in Nigeria and immediately traveled to the northeastern part of the country. Since we are gathered today with particular focus on the abductions from Chibok two years ago it is also important to note that the Brethren have been present in Chibok since 1937 and established the first school in either 1939 or 1946 (there are different dates recorded). Additionally, not only was the school where the abductions took place founded by Brethren before being a government school, but the Church of the Brethren in Nigeria (in Hausa Ekklesiyar Yan’uwa a Nigeria—EYN ) reports that a majority of the girls kidnapped two years ago were Brethren. As we consider the 2nd anniversary of these abductions it is vital that we remember the larger regional context, insecurity, and displacement. In January this year I traveled to Nigeria and into the northeastern region. Though I had worked with EYN doing peacebuilding work in northeast from September 2009 to December 2011 (which was about a month after the first Boko Haram attacks until the situation began to get dramatically worse), I had not returned until earlier this year. On my trip at the end of January I traveled by car from Abuja through Jos and Bauchi to Yola, the capital of Adamawa state. We then continued north to Mubi and on to Lassa which is in southern Borno state and not far from what is still said to be a “no-go” zone past Michika. I will make several observations based on this trip and the US Church of the Brethren’s work with EYN to address the ongoing crisis of displacement and insecurity. 1. Though many more people had returned than typically reported, security and food security was still tenuous at best. I observed that at first look things appeared more normal than I expected, however the security situation remains tenuous with many smaller attacks going unreported. Additionally, reporting, verifying, and predicting the number of persons killed, the relative security of certain villages, and general safety is difficult because the area is difficult to access. Though many people have returned, the legitimate fear of attacks continues to disrupt schools, markets, farming, and life in general in a region that had poor development indicators even before Boko Haram arrived. Despite improved security in many areas and the waning attention to the crisis, it is imperative that the Nigerian government and international community expand relief, education, and peacebuilding efforts. 2. Numbers of killed and displaced are likely higher than official reports. Many who watch Nigeria, do relief work, or attempt to report on the situation say that the officially reported numbers are doubtful. The Church of the Brethren in Nigeria reports that at least 10,000 of its members have been killed and 1,668, or 70%, of its church buildings have been destroyed or abandoned. Boko Haram largely (but not solely) focused on government structures, churches, and Christian communities early on in the insurgency, but has increasingly become more indiscriminant, targeted mosques, Muslim communities, and public spaces such as markets. The massive scale of abductions and deaths as well as displacement and destruction of homes, infrastructure such as bridges, government buildings, places of worship, and schools demand sustained attention and support. 3. Peacebuilding between religious communities is imperative. On my trip earlier this year I observed expanding efforts in trauma healing and continued interfaith peacebuilding efforts. While working in Nigeria from 2009-2011 I focused almost solely on peacebuilding efforts, especially in equipping the Nigerian Church of the Brethren to engage in multiple levels of peacebuilding with a strong emphasis on interfaith peace efforts. One of the efforts came to be called CAMPI, Christians and Muslims for Peacebuilding Initiatives. This interfaith effort sought to build stronger inter-community relationships and capacity for peace as interfaith relationships and trust weakened from the ongoing crisis in Jos, political violence around the 2011 federal elections, and the resurgence of Boko Haram after the initial government clamp-down on the group. Upon returning I had hoped that religious divisions and tensions would have decreased since Boko Haram is obviously also targeting Muslims. Instead, I heard of deep distrust. Even if Boko Haram were to be defeated tomorrow and the girls from Chibok returned, support for peacebuilding efforts would remain vital for a sustainable peace. Critical to this work is trauma healing, trust building, and reintegration of those thought to have aided Boko Haram as well as the imperative to reintegrate and care for women and girls who were abducted and then returned through escape or military intervention. 4. Coordination on humanitarian assistance and longer term development is essential. Some of the hardest hit areas are in southern Borno and northern Adamawa states along the Cameroonian border. I visited a non-registered school in Lassa in southern Borno State, not far from Chibok and areas still considered “no-go” zones. Lassa had been attacked twice near the end of 2014. Even before this crisis, which started in 2009, there were millions of children out of school. In many of these areas, kids who were in school have been out for at least 2 years. At the school in Lassa, which is called “Education Must Continue” there were less than 20 teachers over 2000 students. They were meeting in nearly destroyed police barracks only partially covered by roofs and outside the buildings under trees. The teachers were essentially volunteering and working without any books, paper, desks, or chairs. While these efforts are remarkable, they are only the beginning and cannot be sustained long-term. Greater coordination between international NGOs, the UN, international community, and Nigerian government is necessary. While in Lassa I was escorted around town by local vigilantes to witness a destroyed large Church of the Brethren building, a heavily damaged seminary, and a partially destroyed hospital. Though attacked more than a year earlier and though the hospital had been in communication with the government, to date they had received no support. I remember when our family first moved to Maryland from Kansas. Leaving behind family, friends, and a familiar home felt overwhelming for that distraught 9 year old. I generally like road trips and the adventure that comes with it, but that first drive to Maryland turned me into a puddle in the backseat. I wanted to see my friends. I wanted to play with Legos in my room. I wanted ride my bike through the neighborhood and skid on the dusty streets. Out of this longing grew fear, confusion, anger, helplessness, and I stewed in it for 22 hours in that car. Once we got to our new home, I explored it with my characteristic shyness, slowly and cautiously entering each room as though I was being introduced to someone for the first time. Quietly considering every fiber and tile and curtain, I moved from room to room until we got to the one my parents promised me. I got to have the bigger room since I was the older brother, but there was one little stipulation: the carpet. As I followed the long hallway to my room, I happily saw that my room had more than enough space for Lego-building, but it all had to happen, for the time being, on the most luminous, voluptuous, striking swath of shaggy pink carpet to grace all of humanity. It was beyond my wildest dreams – and not in a good way. The best way I can describe this shock is through a thought experiment called Mary’s Room. Mary is a scientist that knows everything about color – about light waves, the architecture of the rods and cones in the human eye, the neural pathways that interpret color in the brain, all of it. The only catch is that she is isolated in a black and white room for her entire life and has thus never experienced color for herself. The thought experiment suggests that when she finally leaves the room, her experience of color for the first time is profound and new, despite supposedly knowing everything about color. Ignoring the philosophical headache that comes from analyzing this thought experiment too closely, let’s return to the headaches I inevitably got from staring at that neon monstrosity for too long. Nothing could prepare me for that carpet. I knew it was going to be there, pink and shaggy, but there is no way that words could fully capture the essence of that mutated Muppet pelt of a floor. It was like seeing pink for the first time, and I couldn’t fathom why people would do that to their room, to their eyes. Let’s just say I felt very motivated to unload the moving truck and cover the floor as quickly as possible. The season of Lent is largely about expectation. The Lenten season follows Jesus’ march towards the cross. We know the importance of death in his story, but even more recognize the renewing resurrection that follows. All of this is expected. As much as we expect and know the outcome of this Gospel story, the more we need to recognize the ways it defies expectations. Jesus’ ministry, his death, his resurrection challenged Roman authority and even the most pious Jews. In defying expectations, this story becomes transformative and creates a new way of looking at the world that cannot be unseen. Was Mary the scientist forever changed when she saw color for the first time? Could you go back to that dark room knowing that reds and greens and blues lay right outside your door? The story of Jesus’ death and resurrection causes a similar, though more profound, transformation that challenges the way things were before. To be fair to Judas, this scene is rather odd. Commentators argue that the scene symbolically prepares Jesus for death, but that alone does not justify Mary’s actions in the context of the story. This story seems to emphasize the value of timeliness. Jesus has been in hiding because of a plot to kill him, making this a tense time Jesus and his followers. Despair is setting in for many of those close to Jesus, but Mary, in an grand display expresses love and appreciation for the one who is about to die. Jesus’ statement about the poor is not meant to discount their value or needs, but rather respects and affirms the timely response to immediate opportunities for discipleship. The notion of witness is closely tied to this call for timely action. Last fall, the news headlines almost always involved Syrian refugees and that ISIS was going to invade our country through the US refugee program. The terrorist attacks in Paris inflamed this debate further and spawned anti-refugee and anti-Muslim rhetoric that caused many of the DC faith-based organizations to mobilize and counter unwarranted hate speech and misinformation. Representing the Office of Public Witness, I joined several of these coalitions, which aimed at fighting discriminatory legislation, attending Congressional hearings, and educating lawmakers about the importance of refugee resettlement. When thinking of refugees, I think about how jarring my own experience was when I moved away from Kansas. That these persons feel compelled to leave their home country, spend years in refugee camps, and then maybe get settled somewhere else speaks to the desperateness of the situation in Syria and Iraq, to the great need of these persons, and to the power of human resiliency and courage. When I came to Maryland, I left behind a house and some friends. Refugees leave everything behind with no guarantee for a better future. And like 9 year old me, they want nothing more than to go back home. Though Islamophobia and demonization of refugees still scores political points in some circles, the witness of these coalitions offers inspiration for those pursuing the Kingdom of God on earth. Jesus’ defense of Mary arises from this emphasis on timeliness and witness, but also from the humility she learned from him. In a sermon entitled, “Putting Ourselves in Question: The Triumphal Entry and the Renunciation of Triumphalism,” Mennonite scholar Chris Huebner reminds us “that Jesus emptied himself, became humble, and took the form of a servant. Unlike other rulers, he does not rule by forceful imposition. He rules, not by wielding power, but as a servant.” Jesus spends much of his life avoiding glorification and challenges traditional conceptions of Messiah that anticipate a powerful Jewish warlord tossing off the yolk of Roman rule. Instead they got a tektōn laborer, born in a manger, from the backwater of Galilee, home of thieves and simpletons. Jesus’ embraced this humble past and made it a core part of his ministry. In the Gospel of Mark, he even does all he can to hide his Messianic identity. Considering the rest of his ministry, it is doubtful that Jesus’ defense of Mary springs from a need to be lauded or worshiped or imply that his value is intrinsically greater than the poor who suffer. This humility is central to the love Jesus calls us to, and he sees this type of love as Mary anoints him. Because her actions are so extravagant, she embodies a love that defies reason, challenges our expectations, and centralizes the humility Jesus himself exhibited. Mary humbly gives of herself both monetarily and physically as she kneels to anoint Jesus’ feet. Exposed to the judging gaze of those present, Mary’s actions recalls the vulnerability necessary to heed Jesus’ call to love our neighbor, the stranger, and even our enemies. When we consider that Jesus soon would wash his disciple’s feet, the collusion of humility and love in this scene is all the more poignant. Much like the Mary of the thought experiment, the biblical Mary transforms as abstract knowledge becomes a lived experience. Jesus’ anointing is Mary’s instantiation of a learned, Christ-like way of living and reveals the hallmark of discipleship. Jesus ultimately supports Mary because of her actions for her actions, not out of a sense of entitlement or need to be worshiped. She has learned that Jesus calls for love based on vulnerability and intimate connection, flowing from a witness that is sincere, timely, and humble. She is able to see the color that Judas can’t. We are not to avoid vulnerability, but rather defy reason and embrace it. I received a lot of critical emails about the refugee Action Alerts the Office put out last fall and was told, very bluntly, that because I supported policies that kept doors open to refugees, I would be morally responsible for the Americans killed by members of ISIS infiltrating our country. I didn’t challenge the point directly, but mentioned that the lengthy 1 to 2 year vetting process by the UN and US that makes malicious infiltration impractical and infeasible. Besides that point, there is a more important question: Wouldn’t we be equally responsible for the harm caused to the people we turn away? Responding directly to people’s concerns sometimes made them more sympathetic. Their concerns for safety mirror the concerns of those fleeing violence in Iraq, Syria, Guatemala, El Salvador, and Honduras. For the ones I could not persuade, I really wish that I emphasized the vulnerability inherent in a deep theological expression of love. Isn’t love greatest when there is risk, when we are vulnerable? We see Christ’s death on the cross as an act of untamed love, but isn’t that only so because Christ became vulnerable? The trust we extend in that vulnerability reveals a genuine desire for connection and honesty that can’t be replicated otherwise and reaches deep into a person. As uncomfortable as it is, this is the challenge before us. As I close this reflection on Mary’s story, let me go back to the beginning and offer one more thought. Because the scene occurs in Lazarus’ home in Bethany, the scene begins with the acknowledgement that death has been conquered. Inasmuch as this scene foreshadows Jesus impeding death and resurrection, it is situated in liminal space that sits at the threshold of both life and death. This tension and instability is central to Jesus’ ministry. The love that he offers disrupts traditional ways of thinking, disrupts what is comfortable and asks us to witness with humble vulnerability. Inasmuch as we strive to live, to be triumphant, the meaning of resurrection means that we must first accept death and embrace its destabilizing power for transformation. Though some commentators emphasize that Mary prepares Jesus’ body for death, I think we should go a step further and say that Mary is preparing Jesus for resurrection, ushering in new life and a new way of seeing that challenges expectations. How can we be that catalyst for renewal? Sometimes it involves returning to something familiar. Sometimes it’s in embracing something or someone new. Either way, we can end up surprised. The Office of Public Witness offers many chances to be engaged in this kind of transformation, and I encourage you to sign up for our Action Alerts to stay connected with us. The Office plans help organize events for World Refugee Day in June to show support for refugees across the world. If you are interested in helping with one of these events individually or as a congregation, sign up for Action Alerts and contact me directly at jwinter@brethren.org. May we walk together, unsettled and empowered by this radical vision of love that hinges on humility and vulnerability. May our actions be timely as we pursue God’s work. Stepping off Pennsylvania Avenue for lunch, we opened the door as the smell of tomato sauce and bubbly cheese streamed out into the December cold. It was my first time eating at We the Pizza, one of the many aptly-named DC eateries, and while the rich ricotta on my slice of Greek pizza did not disappoint, my new pastor friends from Philadelphia truly made the experience memorable. After ordering two hearty slices of pepperoni, Pastor Keith from the Church of the Overcomer led our merry band of advocates to a booth protected by a six-foot-tall picture of Jimi Hendrix. 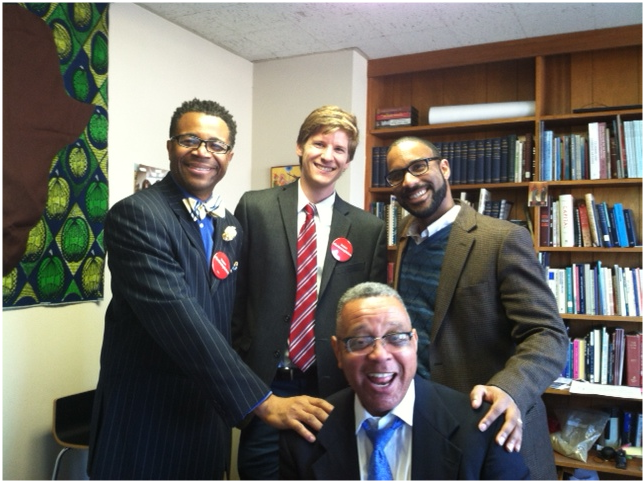 Though they just met the day before, Pastor Keith, Pastor Billy, and Ph.D. candidate Drew Hart carried on like old friends. Laughter erupted between greasy bites of pizza as the three of them shared stories about their work and ministry. Invited by the Interfaith Criminal Justice Coalition, of which the Office of Public Witness is a member, Pastor Keith, Pastor Billy, and Drew were in DC for a national lobby day advocating for sentencing reform in the criminal justice system. Faith leaders from over 20 states attended, and I had the privilege of escorting the Pennsylvania delegation. After visiting with Representatives Fattah and Meehan and Senator Casey, the chance for fellowship and good food was more than welcome. But the seriousness of the day was not lost on them as we ate. Drew, who has written and spoken passionately about the problems of racism in Christian theology and mass incarceration, often punctuated the conversation with thoughtful insights about power and privilege. Pastor Billy, whose ministry involves helping persons overcome drug addiction, spoke about a member of his church who was recently released. “He went to prison for nearly half of his adult life just for doing drugs,” he said. “After his ‘long vacation,’ as he calls it, he put a lot of effort into staying clean and tried to spend time with his father. “He was doing really great,” Pastor Billy said with a smile. “But then just like that, his father got cancer and died. He couldn’t cope and started hanging around with a crack addict. He’s back in there now.” All of them have heard too many stories like that one. Two members of Drew’s family have spent time in prison, and Pastor Keith runs a community house to help reintegrate ex-prisoners. I have written about mass incarceration and the racial disparity in our prison system, but stories like these really show the need for sentencing reform. Because of long mandatory sentences and unfair three strike laws, drug use has been over-criminalized to the point that half of all prisoners in US prisons are nonviolent drug offenders. These persons are not dangerous threats to society, but rather are victims of drug addiction. The US spent $60 billion on prisoners in 2012, but the way this money is being used is wasteful and single-mindedly punitive. If more of that money was used on drug rehabilitation and not on incarcerating so many nonviolent offenders, we could curb the problem of growing prison populations while doing a better job at preserving human dignity. These were the big goals for the four of us in that pizza shop. The Sentencing Reform and Corrections Act that we lobbied for on Thursday makes strides in the right direction. It reduces enhanced mandatory minimums for drug felons and gives judges more discretion when sentencing low level drug offenders. It also makes the reduced mandatory minimums of Fair Sentencing Act retroactive. Significant to Pastor Billy’s story, the SRCA offers anti-recidivism programming to inmates to help them qualify for early release. While many of the previsions in this bill are good, there are many steps left to take for a true overhaul of our criminal justice system. Jimi Hendrix famously said, “Knowledge speaks, but wisdom listens.” With Brother Jimi watching over the table, these three advocates found wisdom by listening to each others’ stories, forming bonds worthy of their City of Brotherly Love. With our pizza finished, we left the now-hallowed halls of We the Pizza, braved the breezy afternoon chill, and ventured towards our final Hill visit, hoping one more soul could find wisdom in their words. The attacks in Paris on November 13 have further inflamed public conversation about the United States’ role in counterterrorism, but the efficacy of drone warfare as a tool in this endeavor is still largely ignored. On Monday November 16, the National Council of Churches and the Interfaith Network on Drone Warfare hosted a congressional briefing on drone warfare in order to spur much needed debate about the moral and practical challenges surrounding the United States’ burgeoning drone warfare program. Over 70 congressional staffers, faith leaders, and concerned citizens attended. Nathan Hosler, Director of the Office of Public Witness, moderated the panel and led a discussion with faith leaders about the use of drones after the event. As a historic peace church, the Church of the Brethren recognizes that following Jesus’ path requires a radical denial of violence. The Annual Conference of 1988 reaffirmed “the belief and practice of the church in renouncing all war” and raised concerns about covert operations and covert war. Calling them “destructive” to truth, national security, and our relationships with other nations, the Annual Conference urged members of the church and the federal government to abstain from covert operations and covert war. In 2013, the Mission and Ministry Board specifically challenged the use of drones in covert operations. The panelists on Monday echoed many of the church’s concerns. Panelists Wendy Patten from Open Society Foundations and Naureen Shah from Amnesty International USA highlighted the need for increased transparency and accountability. While the United States’ first targeted drone killing took place in 2002, information about the targets of and justifications for particular drone strikes is largely unavailable, obstructing public debate and limiting government accountability. Particularly disturbing is that while the “precision” of drones is often touted, civilian death and unintentional structural damage is commonplace. At another drones hearing in 2013, Zubair, a 13-year-old Pakistani boy, said “I no longer love blue skies. In fact, I now prefer grey skies. The drones do not fly when the skies are grey.” His family were unintended victims in a drone strike. Drones have become a reminder of terrorism – not because they stop it, but because they cause it. The few reports that the United States releases about drone strikes misleadingly categorizes any military-age men as militants rather than civilian, covering up stories like Zubair’s. Retired Lieutenant Colonel Daniel Davis challenged that the primary assertion that the CIA has the right to use drones at all. Citing that drone strikes are preemptive measures against potential threats, Davis challenges the underlying assumption that targets are automatically presumed guilty, even with very little evidence. While he calls this immoral and un-American, he further says this injustice is compounded by the fact that any perceived threat (real or not) is handled with total lethality. Coerced messengers or carriers receive the same end as a violent mastermind – death by drone missiles – often with little evidence and certainly no due process. Yasmine Taeb, Legislative Representative for Human Rights and Civil Liberties, Friends Committee on National Legislation (FCNL) followed up by describing legislative options available to dismantle the United States’ covert drone program and promote accountability. Yasmine also stayed to discuss with members of the faith community about tackling the issue of drone warfare in relation to promoting just peace. The faith community is committed to changing drone policies, and the Church of the Brethren should be proud for its leadership in this effort. This sermon was given by Jesse Winter at Washington City Church of the Brethren on November 15, 2015. The scripture for the service was Matthew 23:23-36. When I was asked to preach today, Nate wanted me to talk about mass incarceration. Criminal justice reform is a major focus of my work in the Office of Public Witness, and over the past few months I have learned how complex that issue is. It involves everything from politics, money, and race to power, privilege, and fear. But even though this issue is important and needs to be discussed, as I read through my sermon last night, my words felt hollow. Given the recent events in Paris, I felt called to table that discussion for another day to talk about the equally complex and important issue of religious violence around the world. With Paris weighing on the hearts of people everywhere, this conversation is necessary and prudent – even if it means rewriting a sermon late into the night. The support for those suffering in Paris on the news and in social media has been tremendous. At least so far, the outpouring of love and support has overshadowed any bigotry and fear mongering, of which I have seen very little. This response is heartening. The human spirit comes to fruition in community, and the people of the world – even those with their noses stuck in an iPhone – have banded together to kindle the fires of hope and comfort. I was shocked on Friday when I watched the news, hearing about shootings and hostage situations turning into mass killings. Eventually had to go away and distract myself. Technology has made this conflict real for us. But as we mourn those in Paris with the rest of the world, we have to remember that such events are just a small part of a global equation that includes all those issues – politics, money, race, class, power, and fear. Paris is just a part of a bigger issue. The rise of religious violence around the world is fast becoming the hallmark of the 21st century. I went to a talk at the Brookings Institution earlier this week that could not be timelier. Jonathan Sacks, former Chief Rabbi of the United Hebrew Congregations of the Commonwealth, philosopher, scholar, and recipient of over 16 honorary degrees, spoke about the his new book, Not in God’s Name: Confronting Religious Violence. Sacks argues that the secularization of western culture has created a West that lacks the mindset and language necessary to tackle an increasingly radically religious world. He argues that the growth of radical groups like the Islamic State is more than just a response to Western decadence. It is a battle of ideas that goes to the core of the three Abrahamic faiths: Islam, Judaism, and Christianity. Like Cain and Abel, the three faiths are locked in a sibling rivalry for the favor of their Abrahamic Parent, a fight that we all know ends in death. Religious radicalization and subsequent religious violence is about identity. The three faiths share many similarities, but they each are distinct, and it is that unique identity which can lead to zealotry and violence. The harder you hold on to an egg, the more likely you will have a mess. This picture may be correct, but even more important is Sacks’ proposed response to this picture. While preserving identity is important, – crucial, in fact – religious, social, and cultural identities cannot overshadow a fundamental human identity. We are all children of God. On that scale, other differences are superficial. Our disproportional attention to Paris, if we are honest, comes out of our shared identities as wealthy, majority white, western nations. Our response, however, needs foresight and breadth that allows us to see the strings that tie those in Paris, to those in Syria, to those in Nigeria, to those in China, Romania, Nicaragua, Russia, Texas, Washington, DC. “On November 1st, a terrorist group named Al-Shabaab killed 12 in Mogadishu, Somalia. A suicide bomber killed 5 in Lebanon on November 5th. An expected ISIS-related bombing killed 12 in Baghdad, Iraq (injuring 15) on November 7th. Boko Haram kills 3 in a suicide bombing in Chad on November 9th. In Cameroon, November 9th, a 14 year old girl acted as a suicide bomber killing 4 persons. 43 die and 240 are injured on November 12th by ISIL suicide bombers in Beirut, Lebanon. In Baghdad, Iraq, again, on November 13th, 19 are injured and 33 are killed by ISIS. Last month, ISIL killed 244 people in Sinai, Egypt on October 31st. Bombings killed 27 and injured 96 on November 23rd in Yola, Nigeria and on October 14th, 42 were killed by suicide bombers in Maiduguri, Nigeria. On October 10th, Boko Haram kills 38 in Chad. 102 die and 508 are injured due to suicide bombings in Ankara, Turkey due to ISIL. Car bombings kill 57 in Baghdad, Iraq on October 5th due to the Islamic State. In Abuja, Nigeria, Boko Haram kills 18 on October 2nd. I could keep going and mention the 145 that died and 150 that were injured in Maiduguri, Nigeria on September 20th due to Boko Haram, and so forth and so forth. And yesterday, 129 (so far) people died in Paris, France. I have changed my profile picture, read the news about these attacks diligently, found relief that Facebook notifies that people are marked safe by these attacks, gotten into lengthy discussions on how to solve this problem, etc. And yet. I have done absolutely none of that when persons died in Turkey, Nigeria, Iraq, Cameroon, Chad, Egypt, Syria, etc. Why not? That might be the most important question to come out of this whole thing. Our eyes glaze over at such numbers. We are conditioned to not pay attention. Mark’s question is right. Why, only now, are we really paying attention? Racism, xenophobia, and lack of a shared identity inhibit our ability to connect with those outside of the American suburbs. Again this is an unfortunate side effect of our conditioning and media bias and blah blah blah – but we have to own it. Jesus rails on the Pharisees for being hypocrites. While I don’t accuse anybody here as individuals, our nation as a whole is blind. We need to recognize our blindness, and even more, we need to make sure that Paris – in all of its horror, spectacle, and sadness – becomes the mud Jesus spat in to give us new sight. While it may have taken a bomb in a Paris coffee shop to unite the world, we need to remember the drowned Syrian boy who washed up on the Mediterranean, the Chibok girls taken hostage in Nigeria, those dead in a Yemini hospital. We need to remember a world with seemingly too many wounds to heal. The Church of the Brethren has been faithful in its commitment to peace and stability in many of those forgotten places – especially Nigeria. The Church should be proud of its work, but we need to know there are still many places left untouched by a helpful hand. The last part of the scripture is about humility. The Pharisees laud the heroes of the past and distance themselves from those who murdered the prophets. Jesus bursts that prideful bubble and tells them to own both the failures and successes of their ancestors. Paris, too, I think has broken the West’s pride. There is a sense that the West is insulated from the problems of the rest of the world. The wars we fight are overseas – not at home. The events in Paris show that the bubble is broken. We stagger in disbelief: “This doesn’t happen here!” Our pride is our ignorance, and we need to admit that, through a series of unfortunate events, we played a role in this tragedy. As we move forward, we need to do so with humility. A recent international poll says that the US – not Russia, Iran, or North Korea – is the greatest threat to world peace. Even when acting with good intentions, this country has been both a direct and indirect cause of suffering in the world. How we move forward matters. We also need to watch where we go after the initial shock of Paris goes away. Paris is fast becoming a symbol, and while support rains down now, where will that energy go? Will we be a shield that protects human dignity, or a sword that severs people from it? If we take the second option, are we forfeiting our own humanity? Jesus tells the Pharisees they have ignored the higher duties of justice, mercy, and faith. He told us to love our enemies. In a time where the world is so emotionally invested, I think the greatest challenge will be forestalling the call to vengeance, tempering our justice with mercy, walking forward in faith, loving our enemies. Our world needs this more than ever. I don’t offer any concrete course of action, 1) because I don’t have a clue where to begin and 2) because I don’t think it is time. Emotions are high. Action is important, but any step forward needs to be done with a level head. In these troubling times, the world needs to hear our prayers for peace. Jesus’ story promises redemption. May we redeem this world by remembering our kinship to all persons, especially those who commit violence out of hate. May we climb this mountain with humility, sending our loving voices down through the valley. May we take to heart the words of a true disciple: “Darkness cannot drive out darkness; only light can do that. Hate cannot drive out hate; only love can do that.” All this falls upon our generation. Benediction: God, we come to you in the need of prayer. We ache and mourn for those in Paris. We hear their cries. But we know their cries are but an echo, for all over, fear and terror and violence rule the lives of so many. God, send your love to the people of this world. May it heal those who hurt and transform those who hate. Be there in the midst of suffering. Be there with policy makers as they discern the fates of nations. Be here with us as we struggle to find our place amid madness. We pray for peace and we pray for your light in the weeks ahead. Amen.